Calico Cat is a new project from Haunted Stereo member Andy Harris. 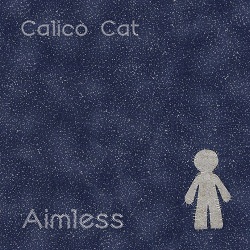 On first listen, ‘Aimless’ reveals just how packed with melody Calico Cat are: “When it boils down to it, there is nothing I love more than a well crafted pop song”. Steven Meritt (Magnetic Fields), Elliot Smith, Stuart Murdoch (Belle & Sebastian) and Evan Dando (The Lemonheads) are all sighted as influences. B-side ‘Barely Knew’ continues in a similar vein, stripping back Andy’s tuneful compositional style for a live acoustic performance. Recording sessions for Calico Cat have been going on behind the scenes for many months now. An EP is to follow on May 7th, which is to include a number of Sotones cameos: Dave Miatt (aka Jackie Paper) appears on Aimless itself, Richard Lomax of Johnny5thWheel&thecowards, Joe Kelly of Etao Shin and Anja McCloskey all feature on the EP alongside some Haunted Stereo bandmates. Andy has formed a live band to support the release of both the ‘Aimless’ single and the EP with dates in the South and London already booked.